In the 2014 baseball season, teams averaged only 4.07 runs per game. That represented the nadir of a steady decline since the 2000 season, and the lowest run production since 1981, when the figure was 4.00. In comparison, the figure had been more than a run higher (5.14) as recently as the year 2000. Trends like this tend to distort our perception of player achievement. A slugger who batted in 102 runs in 2014 is as productive as one who batted in 129 in 2000, yet those two RBI figures look very different to our eyes. Lacking in-depth analysis, we perceive a player who bats in 100 runs to be a solid middle-of-the-lineup guy, a good player, but one possessed by virtually every team in the majors. On the other hand, our mental shortcuts determine a player who drives in 129 teammates to be a premier slugger, possibly the league leader. 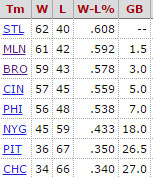 In fact, no player came within ten of that number in 2014. Similarly, a pitcher with a 3.74 ERA in 2014 was an average major leaguer, a sturdy third starter, but in 2000, that would have been good enough for third place in the American League, behind only Pedro Martinez and Roger Clemens, and barely behind Clemens (3.70) at that. The detailed reasons for that decline are outside the purview of this article, but the simplified explanation is that the pitching distance was changed from 50 feet to 60 feet in 1893, and that change resulted in an immediate upsurge in run production. In 1892 the runs per game figure looked like a modern number and was in fact lower than in the year 2000, but the modified pitching distance immediately gave batters a massive edge which they only gradually relinquished as the existing pitchers learned how to adapt, then new pitchers arrived who had developed their deliveries from the longer distance. Given those sharp contrasts between the apogee and perigee of run production, it's amazing that the baseball itself has not changed appreciably in size and weight since 1893, which was the first season played with both overhand pitching and the modern pitching distance. Many other things have changed: the inside composition of the ball, playing conditions, ballparks, mitts, the height of the mound, the size of the strike zone, the strength and conditioning of the players, the hitting strategies, the use of relief pitchers, night games, PEDs, how often the balls are changed within a game, and various rules here and there. Whenever the game has tilted too far toward either offense or defense, the lords of the game have begun tinkering with counter-strategies to restore some kind of equilibrium satisfactory to players and fans. In order to understand the value of various players throughout baseball history, we need detailed analysis to adjust our perceptions of the players' stats from year to year and era to era. 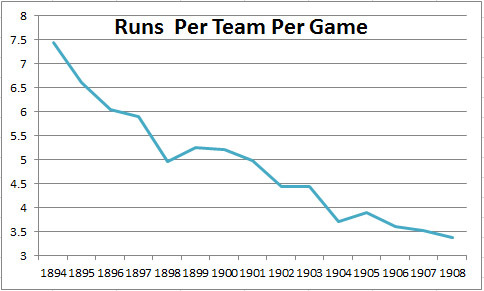 As shown in the graph above, the run production per game dropped from 7.44 to 3.38 in a relatively short period at the turn of the 20th century, so 70 RBI in 1908 were approximately equivalent to 150 in 1894. (Well, these would be hypothetical, retroactively calculated RBI, since that particular statistic was then unknown.) It is not easy for us to accept the fact that a 70 RBI man and a 150 RBI man are equivalent. It is equally difficult to understand that Pedro Martinez's 1.74 ERA in 2000, when the major league ERA was 4.77, was actually better than Bob Gibson's 1.12 in 1968, when the average of MLB was 2.98. In fact, Gibson's season was only the sixth-best of the modern era, relative to the league's performance. Greg Maddux alone had two better seasons. 1894, when the game reached its offensive peak. 2000, which was the peak year of the offensive revival that occurred from 1993 to 2009. The goal: to compare contemporary baseball to the top offensive seasons in history, in order to determine precisely what has changed. The first thing we learn from that comparison is that on-base percentages have declined steadily. We then can determine that walks have relatively little to do with the decline. The number of walks per 550 at bats has remained relatively constant since 1894. And therefore, since walks are not really to blame for the decline in on-base percentage, we realize that batting averages have declined steadily, ultimately dropping 55 points since 1894. We have therefore found our culprit in the case of the declining on-base percentage: the number of singles per 550 AB has steadily declined. A decline from 125 singles per 550 AB to 93 represents a loss of .058 in batting average, and that explains the entire decline for the past 120 years. Knowing what has changed drives an investigation into why. On the surface this fact seems puzzling, because baseball has a little-known constant which is worded as follows: excluding extra-base hits and strikeouts, batters achieve a single once out of every four times they put the ball into play. And that finally ends the quest to determine why on-base percentages have declined. Since batters have always had approximately the same success rate - about one in four - when putting the ball into play for a single, and since neither the number of extra base hits nor the number of walks has changed significantly, the simple answer to the decline in OBP is that batters are not putting the ball into play as often. Bingo! With the possible exception of the fact that modern players hit ever more homers and ever fewer triples, the greatest change in baseball offenses from 1894 to the present has been the number of strikeouts per 550 AB. In a hypothetical season of 550 AB, the average player in 1894 would put the ball into play for a single about 474 times, since he would hit 44 extra base shots and whiff 32 times. By 1930 that number had declined to 452 tries, then to 396 in 2000, and finally all the way to 380 in 2015. That decline represents an immense difference. For an average player, it means that 94 at-bats per year that used to result in fly balls, line drives or ground balls, thus presenting a one in four chance of a hit, are now terminated while the batter stands in the box. Why? It may be that today's pitchers are faster and have more pitches in their repertoires; it may be that today's pitching strategies force the batter to face a fresh arm far more often; it may be that today's batters more frequently swing for distance rather than contact; it may be that there has been a decline in the art of bunting for a base hit; it may be (and probably is) all of these things. The explanation may be complex and nuanced, but the conclusion is not: the one and only reason why on-base percentages have declined over the years is simply the steady decline in the frequency of batters putting the ball into play. To address the question posed at the top of this page - "What Happened to the Offense?" - the answer is obviously "strikeouts." This trend is not at all in remission. 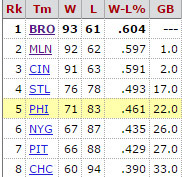 Today, there are 7.7 strikeouts per team per game. At the beginning of the decade the figure was 7.1. At the beginning of the previous decade it was 6.5. In 1990, it was 5.7. In 1980 it was 4.8. There were some up and downs in the 1950-80 period, but in 1950 the number was 3.9. In 1940 it was 3.7. In 1930 it was 3.2. That number went up and down a bit in the 1893-1930 period, but in the first year of the modern pitching distance, it was 2.13. Here is the chart that reflects all the data referenced above. All non-percentage numbers are expressed per 550 AB. I use that arbitrary number because it represents, to us, a typical season for a typical full-time player. We understand the difference between a 30-strikeout player and a 90, or the difference between a two-homer man and an 18, so it is easy to view the chart and immediately perceive what kind of player performance was typical in an era. We know that batters in 2015 hit .254 overall and .329 when not striking out. Thanks to Fan Graphs, we also know approximately how that breaks down by type of contact. How does this affect pitching statistics? It is astounding that with all the changes in baseball since 1894, the needle here has not moved. That statistic stays relatively constant from team to team and pitcher to pitcher as well, although a single season may not be adequate for the stability to be apparent because of the variations caused by relatively small sample sizes. While a modern major league season produces overall statistics based on some 180,000 plate appearances, and therefore reflects an accurate measurement of performance relatively unaffected by random variations, an individual starting pitcher will only face about a thousand batters or fewer in a season, so his statistics will be more significantly vulnerable to the vicissitudes of chance. But even there we can see the truth of the axiom. You know that batters hit for very low averages against Randy Johnson, and 2002 was his winningest year, when he won the Cy Young by going 24-5 and leading the league in wins, winning percentage, strikeouts and ERA. He allowed only 6.8 hits per nine innings, compared to a league average of 9.0. So what did batters hit against him when not striking out? They batted .321, the same as they hit against any mere mortal. Pedro Martinez had a similar season in 1999, when he was 23-4 and led the league in all those same categories. Batters hit .343 against him when not striking out. Bob Gibson's winningest year was 1970, when he went 23-7. Batters hit .315 against him when not striking out. What additional value derives from knowing this? Take the number of innings pitched and derive the number of pitching outs. There are three outs per innings, but only 20 of every 21 outs is created by the pitcher. The rest come from baserunning, so the number of pitching outs = innings pitched times 20/7. Subtract his strikeouts to get the number of other pitching outs. Divide the total by 2/3 to get the number of other at bats against him. (If hits represent 1/3 of the at-bats, then outs must be the other 2/3. Multiply that number times 1/3 to get his hits allowed. You can combine those steps of course. Steps three and four are easy to combine because dividing a number by 2/3 then taking a third of the result is the same as taking half of the original number. Therefore, half of (20/7 IP)-K is 10/7 IP- K/2. In English, multiply innings pitched times 10/7, then subtract half of strikeouts. The last row in each chart represents the equilibrium point, the place where strikeouts are equal to hits. For example, if a pitcher strikes out 8.57 batters per nine innings, you would also expect him to allow about the same number of hits. Does this knowledge have any practical value? Maybe. These charts enable one to identify pitchers with special talents. If a pitcher strikes out only three players per nine innings, for example, but consistently manages to hold the opposition to nine hits in those innings, then he has the ability to defy the .333 constant in some way, perhaps by inducing weak grounders, perhaps by getting many fly balls in a cavernous ballpark. Such a pitcher was Ned Garver, the only man ever to win twenty games for a team that lost a hundred. He went 20-12 for the hapless 1951 Browns, a feat so miraculous that it earned him the start in the All-Star Game and second place in the MVP balloting. In the course of his career he averaged only 3.2 strikeouts per game (defined as nine innings), but allowed only nine hits, as compared to a predicted eleven. He did this by defying the .333 constant. Over the course of his career, batters hit only .286 against him when not striking out. Hall of Famer Robin Roberts also managed to defy the constant. Over the length of his career, batters hit only .292 against him when not striking out. In the peak of his career, 1952-1955, when he led the league in wins every year, he allowed a typical number of extra base hits, but demonstrated a remarkable ability to prevent singles, especially in his home park. If these sorts of pitchers can be identified, and if it is possible to determine the reasons for their success, they can be placed in situations suited to their talents. More info here. 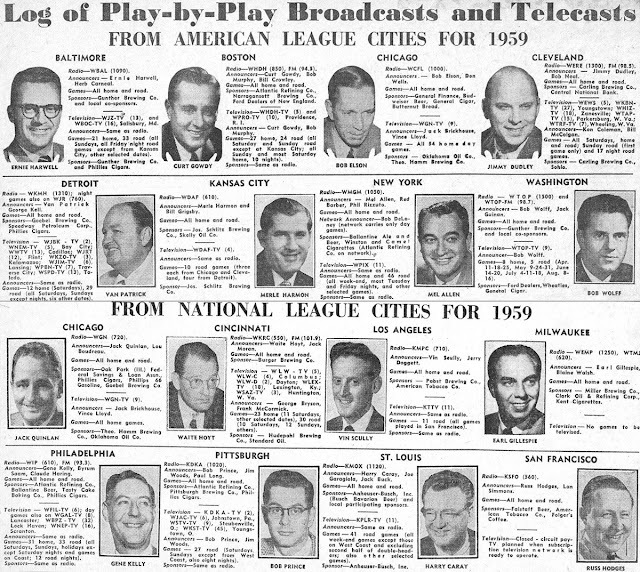 That link (Baseballchronology.com) lists the TV and radio announcers all the way back to 1924, including brief bios of the most important figures. No, I'm not writing about Ted Williams. 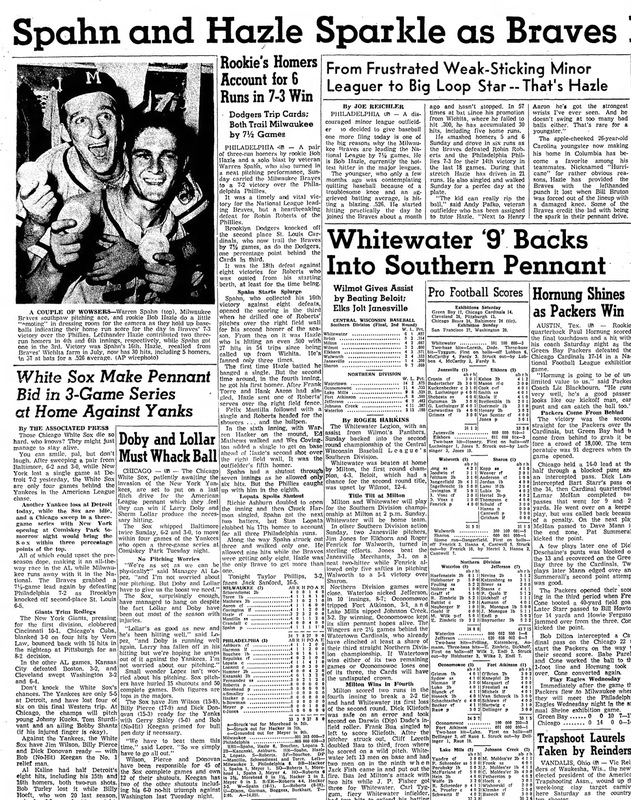 Everyone who loves baseball knows that he batted more than .400 in 1941 and capped it all off by getting six hits on the last day of the season. I don't know if there's anything more to say about Teddy Ballgame. His life and career have been dissected like a frog in a high school bio class. He was one of the rare humans whose fondest wish came true, that one day he would walk down the street and people would point at him and say, "There goes Ted Williams, the greatest hitter who ever lived." ... Bob "Hurricane" Hazle, the last .400 hitter, who is seen below in his one and only baseball card, from the 1958 Topps series. For, you see, there are many ways to define "the last .400 hitter." It may be the last major leaguer to hit .400 or more in a full single season in which he qualified for a batting championship (Williams in 1941), or perhaps the last man to hit .400 or better over a stretch of 162 games, whether in a single season or not (Tony Gwynn, from career game #1551 on Jul 27, 1993 to game #1712 on May 13, 1995), or perhaps the last man to hit .400 in a single season with 150 or more plate appearances (Bob Hazle, 1957). Hazle not only did that, but did it during the pressure of a pennant race when his performance was critical. 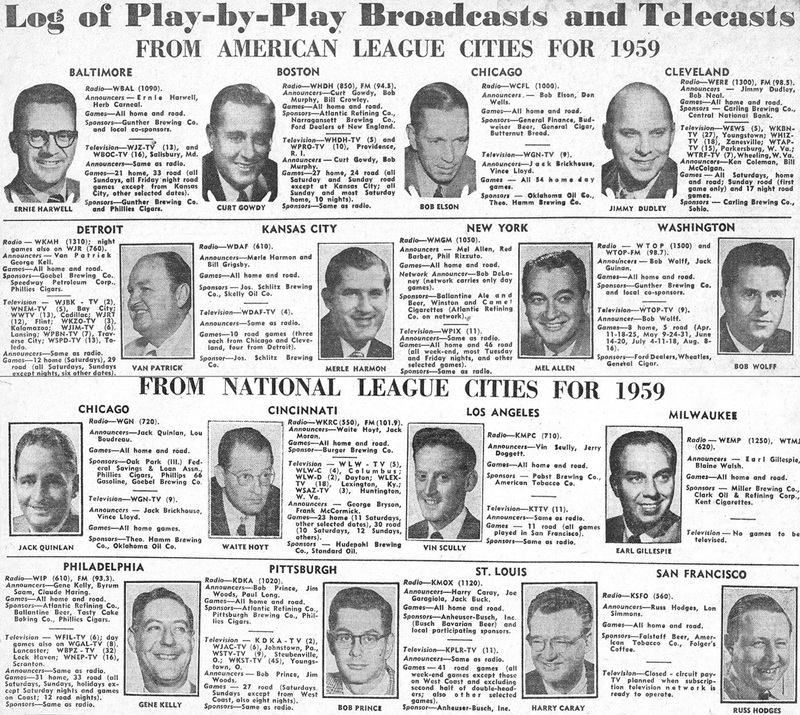 Let's back up to the beginning of the 1957 season. 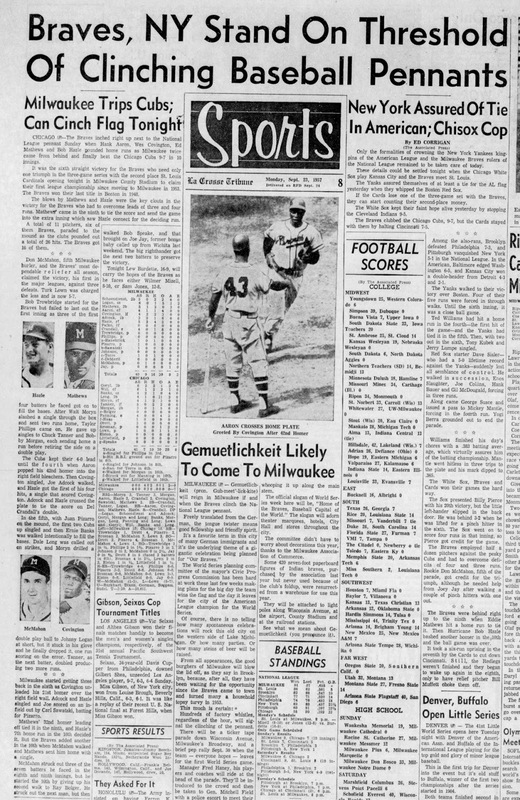 The Milwaukee Braves were coming off a near-miss in 1956, when they had finished in the middle of a three-way pennant race (right) which was decided on the last day of the season. The Braves were actually up a half-game with two left to play. At that point the second-place Dodgers had three more games to complete. The Braves won one and lost one, while the defending champion Dodgers won all three, to give them their last pennant in Brooklyn. 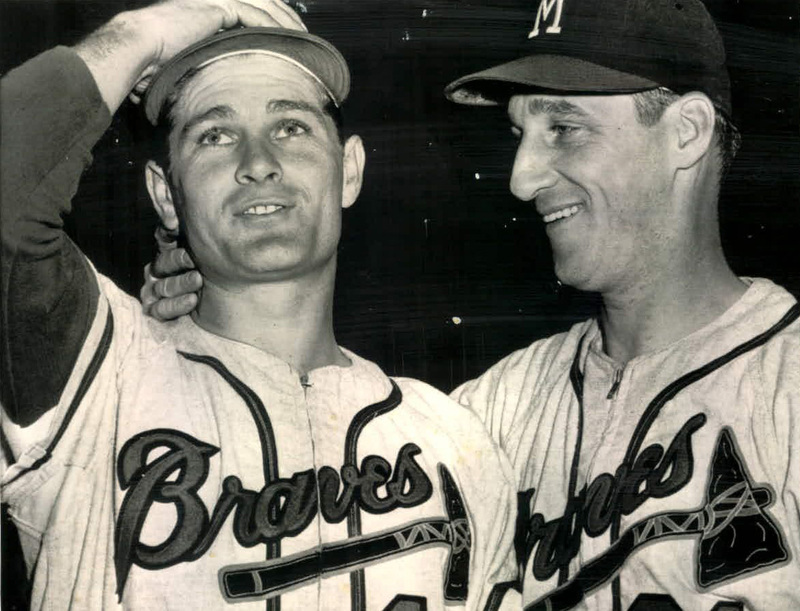 The Braves felt that things were going to change in 1957, because the Dodgers, who had been virtually perennial champs since Jackie Robinson had come up in 1947, were obviously fading. As the 1957 season began, the core members of the Bums' great six-time pennant-winning team had all passed their primes. Robinson, Cox and Reiser were gone. Pee Wee Reese was 38, Campy 35, Furillo 35, Hodges 33, Newcombe 31, Snider and Erskine 30. The Braves, in contrast, were loaded with young guns. Superstars Ed Mathews and Henry Aaron were 25 and 23, while hard-hitting catcher Del Crandall and slugging first baseman Joe Adcock were still in their 20s. They had bolstered their team significantly by filling their only real weak spot with a future Hall of Famer, switch-hitting second baseman Red Schoendienst. They were loaded for bear. But a lot of things went wrong. Left field was supposed to be handled by a capable platoon of old-timers, Andy Pafko and Bobby Thomson, each of whom entered the season with more than 200 lifetime homers. Centerfield was considered one of the team's strengths when manned by speedy Bill Bruton, who had led the league in either triples or stolen bases in every year of his career. But Bruton and Pafko were plagued by injuries, and Thomson had to be surrendered in the Schoendienst trade, so the team found itself short of outfielders. Their only option was to reach down to their AAA club at Wichita. First they brought up Wes Covington to play left and then, when Bruton was injured, brought up Bob Hazle to play right, allowing Hank Aaron to move over to center in Bruton's stead. That didn't seem like a positive situation at the time, but it certainly turned out to be. Covington had an OPS of .875 for the season, with 21 homers in only 328 at-bats, while Hazle turned out to be the second coming of Ted Williams, at least for two months, with an OPS of 1.126 (Williams' corresponding figure was 1.116 lifetime.) The combined OPS of the two left-handed Wichita call-ups was higher than that of the club's big sluggers, Mathews and Aaron. As you might imagine, adding the equivalent of a second Mathews-Aaron combination gave the team a turbo boost. The Braves were ahead of the aging Dodgers at that point, but found themselves a game and half behind the Cardinals. And then they were blown forward by a powerful force, a young man who arrived in Milwaukee as Bob or Bobby, but who soon became known as Hurricane Hazle. His namesake was a notorious tropical storm that had devastated the coast of South Carolina in 1954 and had moved from there through the eastern United States with such force and eccentricity that it had eventually meandered all the way to Toronto where it became, and may still be, the worst natural disaster ever to hit that city. As you might imagine, Toronto is not designed to be hurricane-proof and the people of that inland city have no idea how to prepare for a hurricane or what to do during one, so the storm left an unprecedented trail of destruction and death there in October of 1954. Hurricane Hazel became as notorious in its time as Katrina would be two generations later. Like Katrina, any mention of it was universally understood as a symbol for devastation. 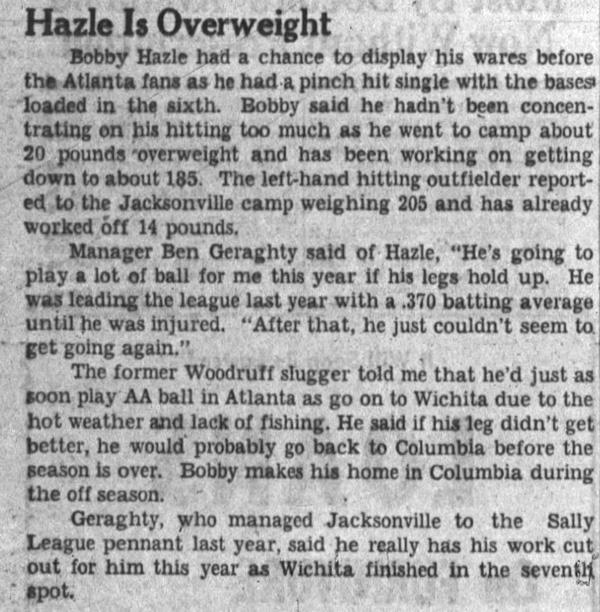 Bob Hazle, also originating in South Carolina, had a metaphorically similar impact on the other teams in the National League. He made a Milwaukee debut that was unlike anything in baseball history. The Braves won the first eleven games Hazle appeared in, while outscoring their opponents 99-34. In eight of those eleven games they scored eight or more runs. Hazle himself had a four-hit game and three three-hit games in that streak, and ended that run with a batting average of .545. In less than two weeks, from August 3th until August 15th, his team had climbed out of their game-and-a-half deficit, all the way up to an eight-game lead, and it was the Hurricane who had blazed the upward trail. The team had been averaging 4.65 runs per game through August 3rd, which was barely above the league average of 4.4, but that figure soared to 5.75 after Hazle became a starter. He finished the season with a .403 batting average, a .477 OBP and a .649 slugging average, easily besting Mathews, Aaron and Adcock in all three categories. 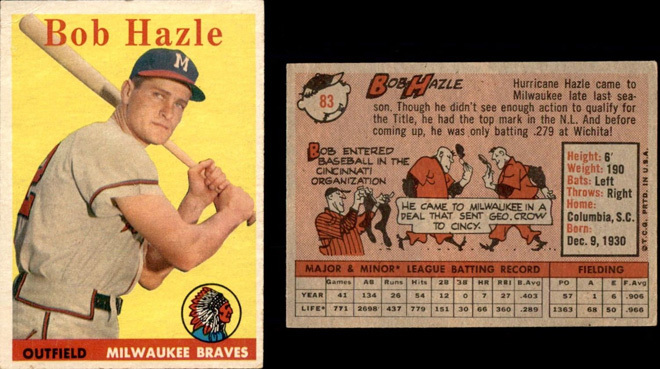 Some years later, a sportswriter asked Eddie Mathews why the team had voted Hazle only a partial World Series share. Without hesitation, Mathews replied, "We were really that cheap? Damn, that's awful. We couldn't have won without him." Later that year Hazle said, "I thought I had had it. I decided if I didn't make the majors in '57. I would call it quits and go sell insurance or something. I got to camp this spring and the knee still bothered me. I was ready to take the first bus back home." Hazle's baseball career after that season turned out to be no better than his efforts before that point. In April and May of 1958, he suffered from two beanings as well as an ankle injury, which kept his appearances infrequent and his performances weak. He was sold to Detroit for about five bucks and a set of Ginsu knives (actually $50,000, according to reports at the time). Detroit used him sparingly in 1958, sent him down to AAA in 1959, and when he showed no sign of the old pop in his bat, demoted him to AA in 1960. He retired after that season. In Lee Heiman's 1990 book "When the Cheering Stops," Hazle is quoted as saying, "My confidence was shot. In the majors, you have it all built up inside you. But when you end up back in the minors there’s the small ballparks again with no one coming out. It’s very discouraging. And even though I was hitting well (in 1960), I just didn’t feel I would ever get another chance. And as it turned out, I was right." As McGuire and Gormley pointed out in their profile of Hazle in "Moments in the Sun: Baseball's Briefly Famous," he retired without losing the conviction that he still had major league talent, but at 29, lacked "the vinegar, the intensity" to fight his way back upward. He had first played AA ball in 1951, at the age of 20, and it was disheartening to find himself back there nine years later, especially after having tasted major league stardom, however briefly. He retired as the answer to a puzzling trivia question which should win many a bar bet: "Among all the position players who have ever played major league ball, who is the only lifetime .300 hitter who never had a season in the .300s?" Hazle finished with an impressive .310 lifetime average, based on one season in the .400s and two in the .200s. That .310 figure is higher than the lifetime averages of Pete Rose, Willie Mays, Mickey Mantle or Hank Aaron - and pretty much anyone else who played the game. If Hazle had enough at-bats to make the list, he'd be just outside the top one hundred of all time. Hazle was not forgotten by those who love the game. Blogger Bob Lemke has recounted his entertaining encounter with the Hurricane at a card show in the late 80s. That blog post also includes a rare photo of Hazle in his late 50s. Lemke has actually gone to the trouble of creating some custom baseball cards for the one-year wonder. 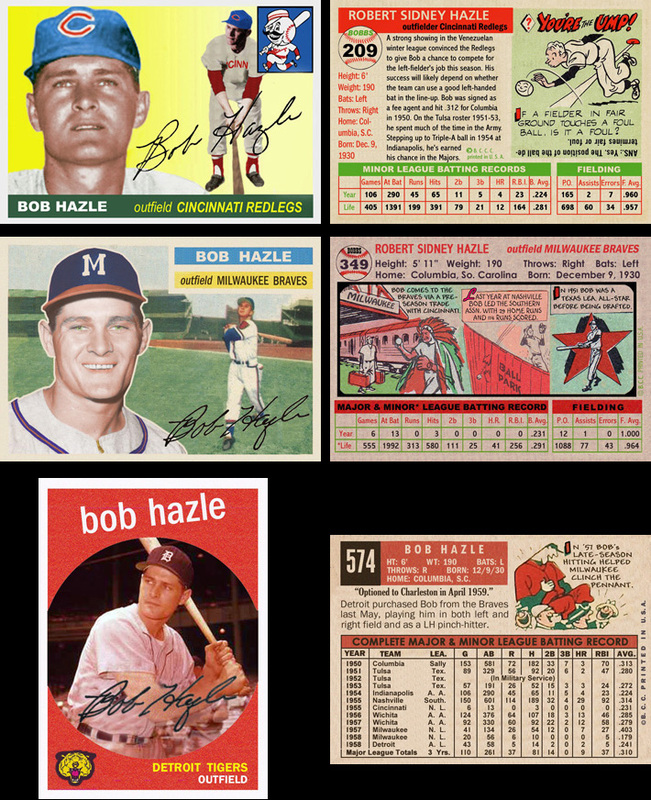 The following mock-ups picture Hazle in the style of the Topps cards from (top to bottom) 1955, 1956 and 1959. The Hurricane was especially well remembered and loved in Milwaukee for having led the Braves to their one and only World Championship in that city. One of his young fans in that triumphant year, David Lamb, grew up to author a book called "A Sense of Place: Listening to Americans." That book really has little to do with baseball, but Bob Hazle became the subject of one of its most poignant chapters, a tale of how Lamb's boyhood favorite became just another survivor, his nose to the grindstone alongside the rest of us, after his glory days had been all but forgotten. After the baseball years, Hazle returned to the small towns of South Carolina whence he sprang. There he became a salesman, trying his hand at insurance and tombstones before finding his niche as the sales rep for a liquor distributor that serviced every local hole-in-the-wall selling booze. Lamb wrote, "His '82 Buick Regal, air conditioner purring, windows rolled up to keep out the heavy, damp, noontime heat, speeds on toward the one-room whiskey stores ahead, carrying a man in pursuit of his livelihood, if not his dreams." Or as John Mellencamp summed it up in a famous song lyric, "Oh, yeah, life goes on, long after the thrill of livin' is gone." Hazle had a heart attack in 1981, followed by open-heart surgery, after which his wife declared “The Hurricane, these days … is really just a gentle breeze.” In 1992 he suffered a second heart attack, and the winds were forever becalmed. Whatever hard times and ordinary times befell him in his last thirty-five years, the fact remains that he was right there in the national spotlight in 1957, laughing and winning alongside Eddie, Hammerin' Hank, Spahnie and the rest. In fact he was leading the charge, as the boys from Bushville won a pennant and then defeated the mighty Yankees in the World Series. "It is desirable that the line from home base through the pitcher's plate to second base shall run East Northeast." - Official Baseball Rules, section 1.04. The chart below shows the orientation of the major league ballparks, the distance of the fences, and the height of the fences (parens following distance). If the centerfield dimension contains two numbers, the first is the distance to straightaway center, and the second is the deepest part of the park. PF (HR) represents the 2014-2015 park factor for home runs only, expressed as a percent. The split is LH/RH. In order to be listed as having a significant impact, the park must have shown at least a 10% effect in that direction in both years. An "x" indicates that there was no statistically significant trend. The raw data comes from baseballprospectus.com. Parks where the batter hits approximately east by northeast (67.5) to straightaway center - as suggested by the rule book! Parks where the batter hits approximately north by northwest (337.5) to straightaway center. The following shows the average (summer) climate factors for the major league stadiums. Covered stadiums are always shown as 72 degrees and zero wind. 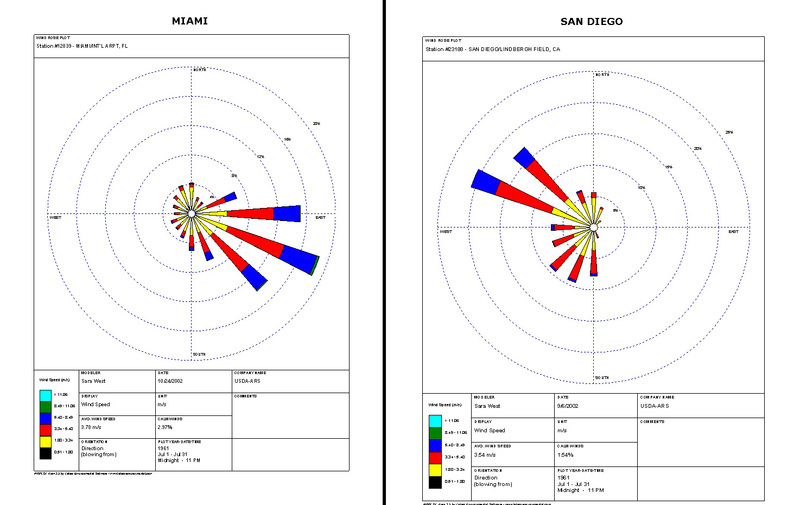 The typical wind direction for any city in any month may be obtained through the NRCS. Extremes are highlighted in red. Most major league franchises now do a significant amount of statistical analysis, and generally use their data to neutralize their parks to whatever extent is reasonably possible, that is to say, they try to make them extremely friendly neither to hitters nor pitchers. For example, if there are too many homers, management may raise or extend the fences; if there are have too few homers, they may block the wind or bring the fences in. Because of this constant tinkering, some of the more extreme park effects have been neutralized, so places like Citi Field, Petco, Safeco and even venerable Wrigley Field seem to be closer to neutral than in the past. You can bet that other places like Marlins Park and Comerica, and maybe even Yankee Stadium, will experience some tinkering in the future. In some cases, it would be impossible to create anything close to a neutral ballpark on the existing site. Denver's altitude is a permanent fixture, and they have no plans to move the fences back any farther than they are. Only the remodeled Wrigley is farther down the lines. It would make perfect sense to make the fences at Coors 375' away along the lines, but it is unlikely to happen because it just doesn't seem sufficiently traditional. The Dallas area is not going to get moderate temperatures in summer. That's the only remaining place in the country where major league baseball is constantly played in intense heat, now that the teams in Tampa, Miami, Houston and Phoenix are all playing indoors. Given that the Arlington stadium is quite new, the Rangers will probably not be getting a roof any time soon. You may think of California as a warm place, and it is in general, but the San Francisco Bay area is the coldest and windiest major urban area in the contiguous United States in the summer. On an average July day, it's ten degrees colder in San Francisco than in "frigid" Minneapolis, and that's excluding the wind-chill, which would make the gap even wider! Like the Texas Rangers, the Giants and As are not going to be playing in neutral weather conditions unless they play in an indoor stadium. That means that AT&T Park will undoubtedly continue to be a right-handed pitcher's dream for many years. As for Oakland, who knows? The fate of that team and that stadium has been the subject of an ongoing debate for as long as I can remember. It seems that iconic Fenway Park will continue to be an extremely negative venue for left-handed power. The right field line in Fenway is already the shortest in the majors, and the fence ... well, you probably have a higher fence in your back yard, so there just doesn't seem to be any additional way to help lefties out. Coors and Fenway face the same problem in opposite directions. Neither a 375' line not a 280' one provide a credible solution which is consistent with MLB's overall presentation. Both solutions could be quite logical, but they just aren't going to happen, especially in a park whose dimensions are considered to be a cultural treasure that connects today's baseball to the game's storied past. In some other cases, the solutions may exist, but are not immediately evident or desired. Nobody has quite determined how to keep the homers from flying out of Miller Park, for example, because analysts have not yet determined why the ball flies out of there in the first place. The fences are high and distant; the climate is fully controlled; the altitude is moderate. There seems to be nothing about the location favorable to flight distance. In fact, the previous ballpark, which was literally on the adjoining lot, was a pitchers' park. In my opinion, the Royals will not tinker with Kauffman Park for a long time. They currently have a team built around small ball. Almost every visiting team has more home run power than the Royals, so the fact that their stadium suppresses homers works in their favor. If they were to somehow suddenly end up with Stanton, Harper or Trout on the team, you could bet that they would start messin' with the place.